Born in a South End, Winnipeg basement in 2008, The Lytics started more as a pipedream than a possibility. Growing up on a steady diet of early nineties hip hop and R’n’B, the three youngest members of the group, Andrew ‘Andrew.O’ Sannie, Anthony ‘Ashy’ Sannie and Mungala ‘Munga’ Londe honed their rhyming skills on torrented Pete Rock, J.Dilla and Dj Premiere instrumentals downloaded on to an old family computer. Their early recordings, rapped through salvaged microphones -- stolen and scavenged from school media rooms -- glued back together and taped to coat racks mimicking mic stands were crude, muddled and amateur, yet showed the youthful exuberance that they would eventually hone and garner critical acclaim for. Meanwhile, eldest of the group, Alex ‘B-Flat’ Sannie -- brother to Anthony and Andrew -- was a burgeoning young producer, making beats for some of Winnipeg’s best rappers and providing the aspiration and inspiration to his younger brothers’ perspiration. As all good stories go, Alex would join his brothers and newly adopted cousin Munga with the goal of taking the group to the next level. They would eventually add local Dj and family friend, Lonnie ‘Ce’ Compayre and their pipedream all of a sudden had legs. 2016 is a long time from those formative years writing raps in a Winnipeg basement and after years of chasing a dream of making music a profession, this group of young emcees seem to be turning the corner on making their dream a reality. Two recordings, three nominations (WCMA’s) and several international and cross Canadian tours later, the group is ready to release their third studio album, starting with ‘Hold On’ their newly recorded EP as lead up to be released this April 2016. 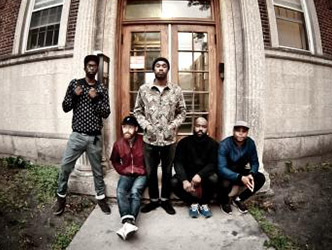 Often citing Pharcyde, De La Soul, Slum village, A Tribe called quest and The Fugees as inspiration, they’ve created a sound that has obvious sonic similarities but with a little something that can only be cultivated in the geographic isolation that Winnipeg provides them. With a musical pallet rooted in Reggae, Soul, Jazz and all things ‘Boom Bap’, their penchant for creating varied soundscapes and exploring different influences is seemingly in their DNA, making The Lytics’ sound something familiar yet completely unique. All this inspiration combined with an ever growing drive and desire to create has enveloped a jubilant, impassioned body of work that is The Lytics’ upcoming EP ‘Hold On’, a thoughtful five song sonic rumination that is at times vibrant and uplifting, other times brooding and solemn and always celebratory and confident. 2016 will see releases for lead single ‘Friction’, as well as showcases at SXSW, CMJ and two European tours with performances at many of Europe’s premiere music festivals in preparation for the September release of The Lytics’ third studio album. All in all, it’s shaping up to be an exciting year -- here’s hoping 2016 is more possibility than pipedream.